Suffolk County Community College students Amie Bernstein and Elisandra Fini have been named one of the top 20 two-year college students in the nation as a member of the 2016 All-USA Community College Academic Team. 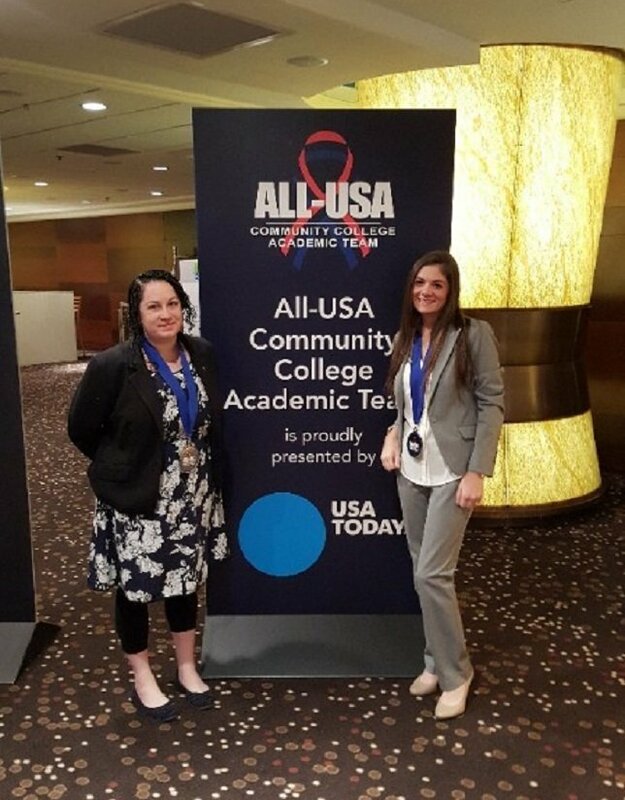 (Left to right): Amie Bernstein and Elisandra Fini of Suffolk County Community College named one of the top 20 two-year college students in the nation as members of the 2016 All-USA Community College Academic Team. Selden, NY - April 18, 2016 - Suffolk County Community College students Amie Bernstein and Elisandra Fini have been named one of the top 20 two-year college students in the nation as a member of the 2016 All-USA Community College Academic Team. The competition included more than 1,900 nominees from more than 1,000 community colleges across the U.S. and evaluated students on grades, leadership, activities and their contributions outside of the classroom. The pair were recognized with fellow team members during the American Association of Community Colleges national convention in Chicago, IL on April 12. Bernstein and Fini will each receive a $5,000 scholarship. Amie Bernstein, a liberal arts and psychology major, from Holbrook, with a 3.7 grade point average, serves as the International vice president for Division I of Phi Theta Kappa and was a former chapter and regional president. Amie hopes to transfer to Indiana University in Bloomington or the University of Mississippi to study Psychology. Elisandra Fini, a chemical dependency counseling major, from Huntington, with a 4.0 grade point average serves as vice-president of Phi Theta Kappa, and is a Get There From Here Scholar. Elisandra hopes to transfer to St. Joseph’s College to pursue a B.A. in Adolescent Education. “We are extremely proud of our students,” said Suffolk County Community College Board of Trustees Chair Theresa Sanders. “The All USA award and scholarships are recognition of extraordinary accomplishment and outstanding promise for the future." The All-USA program is sponsored by Follett Higher Education Group and presented by USA TODAY with additional support provided by the American Association of Community Colleges and Phi Theta Kappa. Welcoming Fall With Festivals, Enjoying Autumn, Events, News & More in September 6th's Newsletter! Subject: LongIsland.com - Your Name sent you Article details of "SCCC's Amie Bernstein and Elisandra Fini Chosen From More Than 1,900 as All USA Scholars"